In 1934, Reverend Walter Hegarty, C.C. wrote a series of articles in The Derry Journal about the history of Donaghmore Parish. They appeared in every Friday edition of the newspaper from January through July 1934 under the headings, “Rambles Round Donaghmore” and “Plantation of Finn Valley.” Copies of the articles recently came to my attention through my correspondence with Msgr. Francis Carbine of Philadelphia who obtained them from the Donegal Historical Society. As you can imagine, these articles covered quite a bit of ground. Rev. Hegarty obtained his information from a large number of sources, and it includes some legend and folklore (not all of which is based on fact). I’ll try to summarize the material of the articles that pertains only to the Roman Catholic parish. When St. Patrick arrived at the Finn Valley in the 5th century he wished to locate his Domnach Mor (large church) “where sunlight first struck in the morning.” Building began on the right bank of the Finn in what is now Barryarrel Townland. Immediately there was trouble. Every night an animal with horns like a goat came out of the river and demolished the builders’ work. (The building material was likely wood or wattle.) Eventually, a second site was chosen on the left bank of the Finn at the present location of the Donaghmore Church of Ireland. Finn had an old, almost blind, dog he named Bran who he loved dearly. Before Finn died, he gave Bran to his relative Oisin. When Oisin was hunting one day in “Carrick,” Bran, who was now almost completely blind, ran into a large rock and was killed instantly. Oisin also greatly loved the dog, and he engraved Bran’s image on a large rock. When Oisin died, he had given instructions that he wished to be buried at the spot where Bran died, and the rock placed over his grave. In his article, Father Hegarty claims that the present Donaghmore COI Church borders Carraic Colman which could be the Carrick told of in the story. This Carrick is a hill with a “giant’s grave” (large rock) in its centre which could be considered the traditional grave of Oisin. After a number of years, the Donaghmore church lands became entrusted to two families with roots in Carrickabraghy, Inishowen. They were the Ua Gallein and the Ua Doireidh (Gallens and Deerys). The families were the eranaghs who managed the land and paid taxes to the diocese and ruling clan of the Finn Valley. Tradition holds that the Gallens occupied land on the left bank of the Finn until the reign of King James I when they were driven off the land by the plantation of English and Scottish Protestants on the church lands. The Gallens had to settle in the townland of Meenreagh. The Deerys are documented in the Annals of the Four Masters for the year 1064 which states that Eochaidh Ua Doireigh was eranagh of Domnach Mor of Magh Ith (ancient name for that part of the Finn Valley). In 1206, Soerbhrethach Ua Doireidh was eranagh. It appears that the name changed through the years from Deery to Gerry to Garrey until the family is listed as Muintergarredie as eranaghs of Donaghmore Parish in the 1609 Inquisition of King James I. The Muintergallons were also listed as eranaghs. In the early days of Donaghmore Parish, the work of rectors and curates were a bit different. The curates had to reside in the parish and look after it. The rectors were not required to live in the parish, and they could be religious students working toward ordination instead of ordained priests. Rectors – One of the rectors of Donaghmore in the 14th century was Hugh O’Deery who later became curate of the parish as well. He was succeeded as rector by Neal MacMelamphy. At MacMelamphy’s death in 1422, he was succeeded by Thomas Carlin, then John MacDaly in 1442, then William Carlin in 1470, and Donal O’Merrigan in 1493, and then Maurice Carlin. Hugh Carlin followed Maurice as rector after that, and became Bishop of Clogher in 1535. During the reign of King Henry VIII, Hugh Carlin switched from Catholicism to the Church of England. Curates – Previously mentioned Hugh O’Deery was both rector and curate at the beginning of the 15th century but was succeeded by the curate Angelicus Carlin. At Carlin’s death, Patrick O’Brain (O’Brian?) was appointed curate. O’Brain resigned in 1420 and Geoffrey O’Deery succeeded him. Meanwhile, Luke Carney applied as curate after Angelicus died, and he formed a separate line of curates. Following Luke Carney there were Henry Maireese, Clement O’Friel (1440), Donal Carlin, Arthur O‘Gallagher (1500s), and Neal O‘Gallagher. In addition to other restrictions, the Catholics of Donaghmore Parish had no place to worship during the time of the Catholic Penal Laws (c.1691-1778). Mass was celebrated secretly outdoors or at private homes. Priests had to disguise themselves and sneak into the parish and sneak out again quickly before being apprehended by priest-hunters who were rewarded for their captures. There is one story about a plan to capture a priest by convincing a man in the parish to pretend to be sick and dying. A priest was called for. When a “beggar” visited the man at his house, he was greeted by soldiers when he departed. The “beggar” informed the soldiers that the man inside had just died. The soldiers went inside the home and found it was true. In the confusion the beggar-priest got away. Many of the clerics who celebrated Mass in the parish were friars and not secular priests. One such cleric was the Black Friar, so named because of his black robes and the fact that he always rode a black horse. On alternate Sundays, he said Mass at Sessiaghoneill. It is believed that the Black Friar kept his horse with the Kyle family, kindly Protestants who ran a mill on the Mourne Beg River. 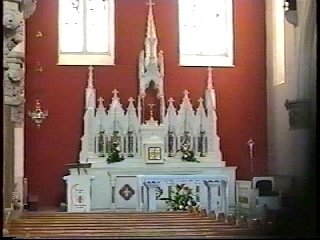 Mass was held at several Mass rocks and Mass houses in Donaghmore. There were two Mass houses along the Mourne Beg River near the Meenluskybane Burn. A priest was killed at one of those houses during Mass. During the penal times in Castlefin, Mass was celebrated at a broad hill known as Cnocramar behind the town. There was a hedge there known as the Piper’s Bush and below it was a rock where a piper came with the congregation. If strangers were seen, the piper would play a tune and the young people would dance to throw off the soldiers. After the piper died, the sound of a pipe was still heard at the site. Later on, Mass was said under the arches of the Castlefin Bridge and in the backyard of Felix Quinn. Among the secular priests to say Mass in Donaghmore during the penal times was Fr. Doherty who became the parish priest of Termonamongan (Co. Tyrone) in.1775. On one Christmas, Friar Curnian celebrated Mass at the Mass rock at Crossroads. A messenger warned him that soldiers were coming. It was then that the Friar predicted that a chapel would be built there someday. In October of 1759, Prime Minister Pitt addressed English Parliament and told them of the King’s command to end interference with Catholic worship. When restrictions eased, a Catholic chapel was planned for Donaghmore. Michael O’Flagherty was named Parish Priest (his brother Anthony was PP of Termonamongan). Fr. O’Flagherty built the chapel himself at Crossroads. It was a rectangular structure with a thatched roof. The chapel was begun in 1790 and completed in 1795. Fr. O’Flaherty died around 1799. According to Fr. Hegarty, the Religious Census of 1766 indicated that there were 708 Protestant households and 685 Roman Catholic households in Donaghmore Parish. The parish had one secular priest (Fr. Doherty?) and one friar. Father O’Flagherty was succeeded by Charles MacBride from County Tyrone. Father MacBride made improvements to the Crossroads chapel. An aisle was added to the centre of the building at right angles to the main aisle, and a slated roof replaced the thatch. Fr. MacBride lived in a house in Dromore Townland. At some point, the Bishop replaced the curate Fr. O’Flagherty with Fr. MacGlade. The parishioners were displeased with this action and were starting a revolt of sorts. When their PP, Father MacBride, died in 1819, the bishop appointed William McClafferty as Parish Priest. The revolt came to a boil and the parishioners rejected the new priest, closing the chapel doors in his face. The new parish priest had to say Mass at a table outside the chapel. When the bishop heard of this, he recalled Fr. McClafferty and left the parish with no priests. After three years, the parishioners relented, and the bishop returned Fr. McClafferty to Donaghmore. 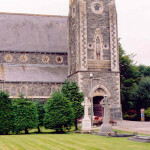 John MacLaughlin was ordained in 1821 and came to Donaghmore as curate. Two chapels (of ease) were built in Donaghmore in the 1820s. The chapel in Castlefin was built in 1822 and the chapel in Sessiaghoneill was built in 1828. 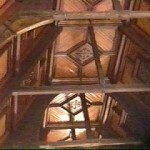 (Today the Castlefin chapel is in Urney Parish.) The parish Priest appointed Fr. MacLaughlin as curate in charge of Castlefin. Fr. MacLaughlin leased the graveyard on land belonging to Mrs. Fox. MacLaughlin then turned his attention on procuring land for the chapel at Sessiaghoneill through either Mrs. Anderson or Mick McMennamin. The chapel was mostly completed before Fr. 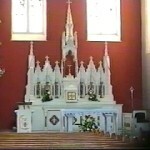 MacLaughlin was transferred and named the Parish Priest of Cappagh in 1828. Fr. McClafferty was transferred to Moville in 1829. He was succeeded by Francis Quinn. In 1834, Fr. Quinn was swapped with Father Charles McCaffrey who was the Parish Priest of Omagh. In 1839, Fr. McCaffrey was appointed to Clonleigh and he was replaced by Father Neal O’Kane. Father Neal O’Kane was born in 1791. He was a professor at the Derry Seminary and took part in the Derry Discussions of 1828 with Fr. Francis Quinn who was then a curate at Templemore. The Derry Discussions were held between six Catholic priests and six priests of the Church of Ireland who “discussed” the differences in their theology. 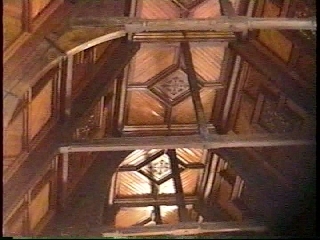 The discussions were held in the Guildhall (then located at the diamond). Diocesan musical chairs: When Fr. Quinn was assigned to Donaghmore as PP in 1829, Fr. O’Kane replaced him as curate in Derry. When John MacLaughlin left Cappagh in 1837, Fr. O’Kane became the Parish Priest there. In 1839, he came to Donaghmore as Parish Priest, replacing Fr. McCaffrey, who moved to Clonleigh. Father O’Kane was the pastor of Donaghmore for only a year when he died under suspicious circumstances. He was quite stout but loved to ride his horse. On Passion Sunday in 1840, he rode home from Castlefin. A while later, some men found a horse grazing on the side of the road, and they discovered Fr. O’Kane covered in blood and lying in the grass. He was dazed and couldn’t speak. They brought him to the home of Widow Boyle and left him at the door. Mrs. Boyle’s servant girl identified him from the inscribed watch he received from participating in the Derry Discussions, and a doctor was sent for. Later that evening, he was brought to the home he shared with Hugh Gallagher. He died the next day. Foul play was considered in his death. When he was in a dazed state, he was asked, “ Did any person do this to you?” He was unable to speak, but he shook his head (not stated whether this was yes or no, but I‘m assuming it was yes). After his death, the matter was argued by many who heard the story. It seems that Father O’Kane had taken part of a mixed marriage which offended a number of people of the Protestant community, some of whom were known to be dangerous. Many had no doubt that these men caused his death. However, nothing was ever proven, and the Derry newspapers reported that Fr. O’Kane died of a fall from his horse. His wake was at the Castlefin chapel, and he was buried in a plot that faces the gate. Father Edward Boyle was appointed Parish Priest after the death of Father O’Kane. He was the son of Edward Boyle of Daisy Hill and Catherine McMenamin of White Hill. Edward (Jr.) was born in 1790 and his brother John was born in 1798. Edward entered Maynooth at age 23 and was ordained in 1819. After ordination he went to Derry. He later became curate at Omagh. In 1825, he became the Parish Priest of Tamlacht Ard (Magilligan) and then Upper Badoney (Plumbridge) in 1833. In 1836, Edward’s father died at the age of 93 and left the farm at Daisy Hill to his sons who kept it running. 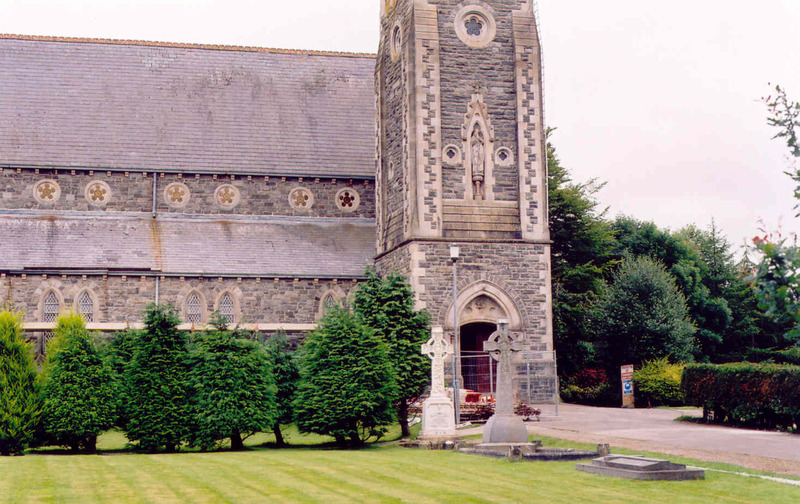 Edward Boyle returned to his home parish in Donaghmore as Parish Priest in 1840. His brother joined him as curate in 1842. After the famine, Edward was determined to build a decent church at Crossroads. He set about collecting money for the new building. The foundation stone was laid on May 12, 1872. The dedication of the church was held on April 25, 1875. For years, many recalled the huge amount of holy water that was used on that occasion. John Boyle had ongoing health issues, and he died in 1882 after 40 years as curate. During those years, several curates passed through St. Patrick’s Church at Crossroads: James MacKenna, John MacGroaty, and Francis O’Neill (a cousin to the Boyles). Edward Boyle died two years later on September 25, 1884 at the age of 94. The curate, John MacGroaty, was appointed Parish Priest. Father MacGroaty immediately started collecting for the spire and bell tower of the church. He died in 1893 before the tower was completed. On August 2, 1896, the bishop came to St. Patrick’s Chapel to dedicate the new spire and bell tower. It was 140 feet high with a new bell that rang out for the first time that day. The chapel at Castlefin was renovated and dedicated on November 10, 1907. Father Joseph McKeefry was PP until he died in 1920. James Morris succeeded him, and during his tenure, he obtained the parochial house as a residence for priests. Father Morris died in 1926. Father Patrick Devlin came to Donaghmore as Parish Priest in 1927. The events in my novel Donegal Generations take place in Donaghmore Parish during the 1700s and 1800s. I am always interested in hearing about the parish. If you have any comments, please post them at this website (tomgallen.com) or at my facebook page https://www.facebook.com/DonegalGenerations/ . Very interesting , I enjoy reading about the history of the Finn Valley. Keep up the good work. I am very interested in your comments about the death of my ancestor Rev. Neal O’Kane. It was always said in our family that his death was suspicious but this is the first time I saw it in print.